Where do serious business people go to learn Internet marketing? Since 1994, many of them have come to training programs I've organized. Students and colleagues of mine played formative roles in companies like Amazon, Yahoo, Netscape and HotWired. Today, a surprising number of today's generation of Internet marketing experts and entrepreneurs trace the big breakthroughs in their careers to attending a System Seminar. Darrell lost his management job after a post 9/11 down sizing. Finding a comparable job seemed to be difficult if not impossible so he pursued a long time dream of starting his own business. Many months and many thousands of dollars later, he was close to throwing in the towel. Then he found the System and within six months he was booking $1,000 + days and now has a rock solid business that grows and grows and most important lets him pursue the thing he loves most: teaching people how to paint. An electrical engineer by training, David developed an interest in sales and marketing and became one of North America's most successful marketers of robotic equipment to manufacturers. Then an article on AdWords and a branch of statistical analysis called the Taguchi Method sparked an insight into how to combine his two passions, engineering and marketing. David is a highly sought after Internet marketing consultant and is prized for his ability to bring engineering rigor to the marketing process. Dave Taylor's experience with the Internet spans the history of the Internet itself. (He logged on for the first time in 1980 as an undergrad at UCSD.) Among other things, he developed ELM, one of the first e-mail programs used on the Internet. In the early 1990s, he was the first person to seriously track and catalog online sales efforts in a publication he called "The Internet Mall." Lloyd is a world class athlete, with multiple US championships in Judo and Russian Sambo and two world championships in Brazilian Jujistu. But martial arts is not like professional football or basketball and his athletic accomplishments didn't translate into dollars. Then he found the System and discovered a way to combine his passion for martial arts with Internet marketing and is now a champion money maker with numerous marketing intensive businesses under his belt. John started an engineering consulting business and struggled for 15 years. Then he met the System crowd, first Perry Marshall, the Ken McCarthy and others. Now in the middle of the worst recession in over 30 years, his business is wildly profitable and growing. Believe it or not, there was once a time when Perry Marshall was not one of the world’s leading authorities on Google AdWords. In fact, even though he’d had significant marketing and Internet experience, the System Seminar was where Perry was first introduced to high level Internet marketing, including the strategy of using pay-per-click as a traffic and testing tool. Like so many System grads, Perry has gone on to become a successful author, trainer and consultant in the Internet marketing field. This video was recorded in 2002 at the end of his first System Seminar. Having trouble playing the video? Dennis Zouras is president of Health Direct, an innovative nutritional supplements firm based in Southern California. Dennis attended his first System Seminar in 2002, four years after he and his partners founded the company. Within one year of this recording, Health Direct added over $1,000,000 in brand new sales to the business, thanks to Internet marketing. Two years later, Health Direct was able to move into its own 42,000 square foot facility in Costa Mesa, California. Alexandria Brown began her career in marketing communications as a publications manager. In 1999, she started her own consulting company AKB Communications which provided copywriting and consulting services to clients including Dun & Bradstreet, New York Times Digital, Scholastic Books, and Adweek Magazine. After experiencing the marketing power of e-mail newsletters first hand, she began teaching clients and others how to use eZines to boost their own business. The course that resulted “Boost Your Business with your Own E-zine” has won multiple Apex awards, a prize given for excellence in publishing. In 2003, Alexandria attended two System trainings. Here’s her comment after the first one. The Radio-TV Interview Report - or RTIR as it’s known for short - is a print publication that goes to over 4,000 radio and TV producers across America. Authors and publishers purchase ads in the RTIR to put their books in front of this highly desirable audience and secure high profile media appearances. Bill and Steve count Jack Canfield and Mark Victor Hansen ("Chicken Soup for the Soul") and Robert Kiyosaki ("Rich Dad, Poor Dad") among their happy clients. Like Perry Marshall, Mike Stewart got his first introduction to high level Internet marketing through Ken McCarthy’s training and the System Seminar. A musician and audio engineer, Mike started building web sites for clients in the 1990s, but it wasn’t until he took a course with Ken that he learned how to make web sites sell. A pioneer of using Internet audio testimonials, Mike was invited to present his then-new ideas about Internet audio at a System Seminar in 2002. This video was recorded a year after he took his first System Seminar. He doubled his income in just one year and three years later he’s more than doubled it again. Wayne Yeager is a serial Internet entrepreneur who sold his first Internet company, Unclaimed Domains, to Internet.com at the height of the dotcom boom. Wayne’s next Internet venture, Trafficology, started off as an experimental eZine and quickly became a major clearinghouse for information about techniques for generating Internet traffic to web sites. Wayne sold Trafficology and started a third company in 2003 called Sellathon.com. Sellathon offers specialized software tools to eBay merchants to help them measure traffic to their eBay listings and stores. Dave Harber is an example of someone who already had a successful Internet business when he came to his first System Seminar. Dave started his business in an unusual way. In 1995, he took a course about the Internet because he thought it would be a good way to display his poker chip collection. He soon discovered there was a thriving business in collectible poker chips and much to his surprise was able to quit his job and pursue his hobby as a successful business. But his business did have one problem: It consumed nearly every waking hour. Listen to how attending the System Seminar turned that around for him. Ron Ipach is the nation’s leading independent consultant to the automotive repair industry. Over 3,000 auto repair shop owners have graduated from his specialized training programs. He shows his clients how to dramatically increase sales without increasing their ad budgets through sophisticated direct marketing techniques. The System Seminar is a favorite of small business owners. Because the System deals in practical advice that produces immediate results - the ‘meat and potato’ issues that really matter like more leads, more sales, and happier customers. Unlike other Internet seminars that get bogged down in techno-babble and the latest ‘gee whiz’ technology, the System keeps its feet planted firmly on the ground. John is a regular at the System Seminar because he knows that every time he comes to a training, he’ll head home with techniques he can use to cover his investment many, many times over. Martin Wales began his career as an educator, then entered the world of marketing and broadcasting. Combining these experiences, he started Customer Catcher, a marketing consulting firm in Toronto, Canada. Martin was introduced to high level Internet marketing at the first System Seminar he attended in 2003. This recording is from that event. Since then, he’s added host of Entrepreneur Magazine’s weekly Internet Marketing radio show and a senior vice president for business development of 1shoppingcart.com to his credits. Cynthia Denton has been involved in the online world since long before the Internet became popular. She was an active member of Big Sky Telegraph, a pioneering computer bulletin board service that connected Montana’s school, communities and Indian reservations. As a professional educator and grant writer, Cynthia has evaluated educational programs in as wide variety of subjects. Listen to what she has to say about the quality of a System Seminar education. After years of painful trial and error, he discovered the direct marketing techniques he needed to make his dream of becoming a professional magician come true. With success as a performer, came a new challenge: being on the road constantly, he was able to spend very little time with his young family. To solve this problem, he created a “how to” marketing course for magicians and other entertainers based on his experience and started teaching them his methods. In 2002, Dave attended his first System Seminar. At the time, his annual Internet income was less than $1,000. Thanks to what he learned at the System, Dave was able to “retire” from the grind of being on the road most of the year. As a bonus is earning far more than he ever did as a professional performer. Tom Conellan is the author of two best-selling books: “Bringing Out the Best in Others” and “Inside the Magic Kingdom” which takes an intimate look inside one of the most successful corporations on earth. Tom created his own business in the health care field and built it into a network of 1200 instructors serving 300 hospitals and most of the Fortune 500 firms. In addition to training business leaders at Dell, FedEx, GE. Sony and Marriott provided leadership training to naval officers and Special Ops units. Barbara Keddy started her career as a journalist and worked as a national news reporter for the Globe and Mail, a leading Canadian newspaper, and as a TV reporter for CBC News. Her experience in the online world is equally extensive. She was the first Director of News for Quantum Computer Services (which later changed its name to AOL) and Global Intellectual Property Specialist for Register.com, one of the world’s biggest domain name registrars. Barbara’s attended numerous System Seminars. Here were her impressions right after attending her first one. Tom Antion got his start in business in the entertainment industry, first as a nightclub owner, then as an entertainer and professional public speaker. In addition to pursuing his own active speaking career, he’s trained thousands of public speakers through his live seminars, home study courses, books and web site. In 1998, Tom launched his first web site to help promote his speaking and training business. Soon after, he started experimenting with niche sites on topics related to public speaking. In 2003, he attended his first System Seminar. After over twenty years in sales and marketing, Otto Collins decided he wanted to do something different with his life. The Internet has been an important part of the Collins’ marketing mix and the System has been an essential part of their Internet strategy. Ross is representative of the many students who fly from all over the world in order to attend the System Seminar training in America. Australia… New Zealand… Japan… Korea… the UK… Canada… the Netherlands… France… Italy… Costa Rica… Switzerland… Germany… Israel… Ireland… Norway… and Sweden. Larry Trocha is a champion horse trainer and competitive rider who has chalked up dozens of wins since entering the field in 1980. He’s also trained countless riders who’ve gone on to win their own championships. In addition to training and competing, Larry makes a handsome living selling horse training video. Prior to attending the System Seminar, all of his sales were via traditional mail order. Now the Internet makes up well over half of his sales. This video was recorded at Larry’s first System Seminar in 2002. Rob Bell is CEO of 1ShoppingCart.com, a company that provides eCommerce services to more than 10,000 small and medium sized businesses. 1ShoppingCart.com was founded in 2000 to bring advanced business capabilities to web merchants that had previously only been available to large companies. Among other breakthroughs, it was the first company to seamlessly integrate shopping carts with auto-responders so that customers receive tailor-made follow up sequences for their purchases and are moved automatically from prospect to customer sequences. As CEO of 1ShoppingCart.com, Rob attends Internet conferences and seminars all over the world. 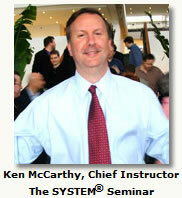 Here’s what he has to say about the System Seminar and how it compares to other trainings in the field. When Howie Jacobson came to his first System Seminar, he was looking for was guidance on how to use the web to help him find clients for his consulting business. What he learned changed his life. From a total ‘newbie,’ Howie, has become a top Internet marketer specializing in copywriting, online conversion strategies and Google AdWords. This video is from Howie’s very first System Seminar as a student. Now he’s on the faculty. The SYSTEM® Seminar is registered trademark of Amacord, Inc.